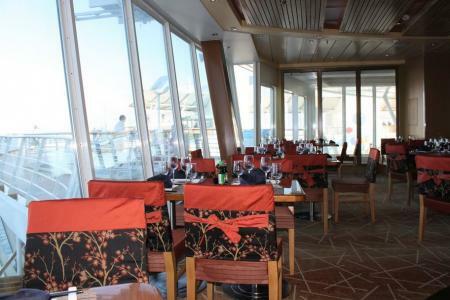 Royal Caribbean's Oasis of the Seas features a number of specialty restaurants that are available to book for an additional fee and Izumi is one of them. Featuring a selection of Japanese food, today we take a closer look at this offering. Izumi is a Japanese restaurant that features a lot of brown and orange with an Asian flare. 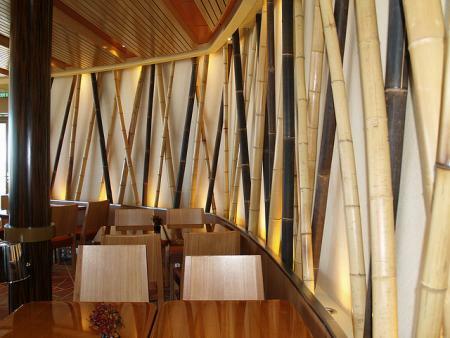 You will find a lot of bamboo and cherry blossoms adoring the interior of the restaurant. Located on Deck 16 of Oasis of the Seas, Izumi partially overlooks the ocean as well as the sun deck and to a lesser degree the pool deck. Only tables near the windows will allow for much of a view. There is also a rather large sushi bar that encircles the chefs that prepare the sushi. Seating here can vary in terms of something to see, as it can be difficult to see the chefs at work while sitting at the bar. Upon entering the Izumi, you will check in and be seated. There isn't much of a waiting area should you need to as the restaurant as a whole is rather small. Once seated, the waiter will bring you a warm towel to refresh your face and hands. This is a staple of any good Japanese restaurant and nice to see. On my recent 7 night Oasis of the Seas cruise, I ate at Izumi every evening except one, so I like to think I got a good idea of the food here. Izumi is a Japanese restaurant and has a few options beyond just sushi. Sushi was the driving force that brought me here, but for those who aren't fans of raw fish, there's also some other interesting options. To start with, Izumi currently features complimentary edamame (a preparation of baby soybeans in the pod boiled in water together salt, and served whole) and miso soup. Both were good and tasty and you can have as much of either as you choose. You will also be offered a choice of various sparkling waters (this does cost extra). Not being a fan of Peligrino or its similar counterparts, I passed on it. Let's start with the sushi. If you're looking for sushi on Oasis of the Seas, Izumi is your only option. Unlike other Royal Caribbean ships, there is no sushi offered in the Windjammer Cafe. In addition to the set sushi menu, there's usually a special roll created each night by the chef. I found the chef's roll to be the best sushi option each night, as they were routinely large portions, fresh and interesting combinations. The sushi on the menu offered some good options, however, I found the options fairly limited compared to the various types of sushi rolls one can get at your local sushi restaurant at home. That being said, there were still many more sushi options in Izumi than I've found in the Windjammer on previous cruises. The sushi itself was fresh and most sushi rolls featured 6 to 8 pieces per roll. Given the price of most sushi to be about $5 per roll, I found this to be a good value. Beyond sushi, the most interesting item on the menu is the hot rock plate. Basically, you get a heated stone the size of a small book along with uncooked meat (beef, chicken or shrimp) along with some vegetables. You take the meat and veggies, stick them on the plate and they cook in front of you. The first time we did it, we had the question of "When do I know when it's done?". The waiter was very helpful in not only telling us, but helping us cook the first batch. This is definitely a fun dish to share, and kids are sure to really enjoy it and a good option for those not keen on really ethnic food. In terms of pricing, I found Izumi to be mostly fair. Entree dishes were good and there is no cover charge, the fee at Izumi is a la carte. There were some items that I found to be rather unfairly priced, however. I ordered a bottle of hot sake and that was $24 (there was no other option) and that special sushi roll of the day cost $10 (most other sushi rolls cost about $5 or $6). It's always a good rule of thumb to ask how much something is when it isn't listed on the menu. Overall I found Izumi to be a good option for fans of Japanese food, specifically sushi. While Izumi features a few different dishes that aren't sushi, I feel their strongest suit is their sushi offerings. I only wish they had a few more rolls to choose from, but given the price of their sushi, it's hard to go wrong. Izumi is open for dinner from 6:00pm to 9:30pm and for lunch at noon to 1:30pm.